If you like beets, you will love this dish. Years ago, a Swedish friend made this salad as part of a larger dinner, and I could not leave it alone. Serve with open-faced Swedish sandwiches (smörgås) and aquavit. 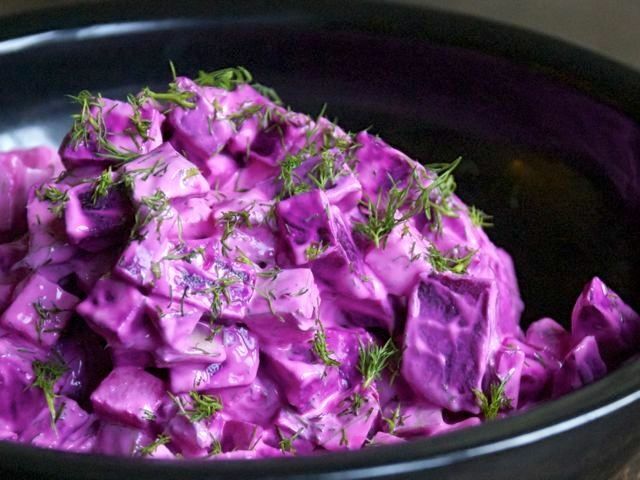 In a medium-large bowl, combine the sour cream with 1 tablespoon of the vinegar and the dill, sugar, and salt. Whisk until smooth. Add the beets and apples. Toss to combine, until the beets and apples are coated and everything is well distributed. Season to taste, adding more salt and vinegar to taste. To cook the beets: Scrub them under water, then trim the root and stem ends. Place the beets in a pot of salted, boiling water (enough water to cover them), then cook at a simmer, covered, for 25 to 35 minutes, or until tender. When the beets are done, the flesh will yield when pierced with the end of a sharp paring knife. Drain the beets and let cool. When cool enough to handle, peel the skins with a knife.